Visitors to the historic mountain villages in central Japan marvel at the elegance of the steep thatched-roof farmhouses found there. Known as “gassho-zukuri,” Japanese for “constructed like hands in prayer,” the architectural style emerged more than 250 years ago to ruggedly withstand the area’s heavy winter snowfalls. 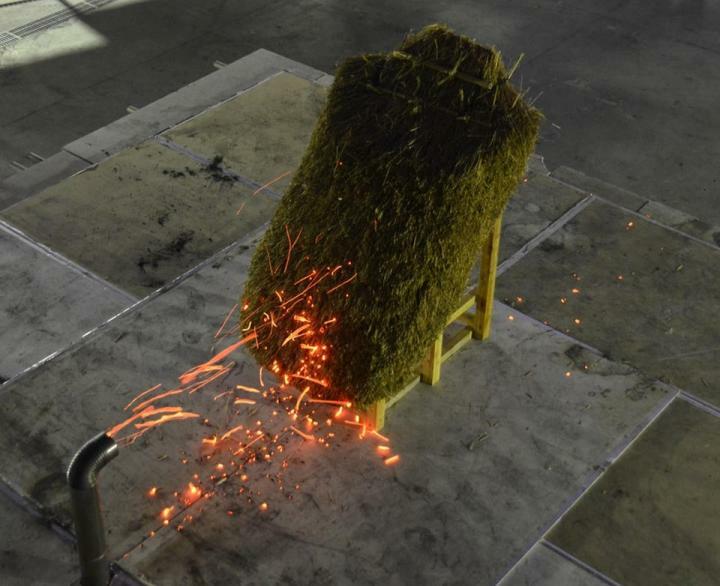 Recently, a National Institute of Standards and Technology (NIST) fire researcher and his Japanese colleague conducted a special fire test to learn how to protect these treasured icons, and other thatched-roof structures around the world, from a more insidious threat: fire. To better understand the mechanisms by which firebrands–the airborne, glowing embers released by an outdoor fire–can ignite a thatched roof, NIST mechanical engineer Samuel Manzello and research scientist Sayaka Suzuki of Japan’s National Research Institute of Fire and Disaster (NRIFD) used the NIST Firebrand Generator, nicknamed the NIST Dragon, to shower continuous streams of firebrands upon 1.1-meter-by-0.9-meter (3.6-foot-by-3-foot) roof mockups made from water reed, bamboo and wood. Workers are seen building a thatched roof on Japanese house.